Big Chief of the Guardians of the Flame, philosopher, family man, and advocate for education, Donald Harrison took center stage in life. He demanded a well-deserved respect from his peers. An African American pushing through the Depression and the Civil Rights movement, he educated himself by reading scores of books while developing an acute understanding of philosophy and a love for jazz music. Based on her husband’s lifelong desire to give back to his community, Harrison’s wife, Herreast, founded the Guardians Institute, a cultural arts center for New Orleans youths. Born in 1933, Donald Harrison quickly immersed himself into the culture of the Mardi Gras Indians despite his father’s disapproval. He served a brief stint in the U.S. Army and returned to New Orleans to start a family, work a series of odd jobs, and pursue his education. Harrison continued to mask as an Indian and endorse literacy programs until his death in 1998. 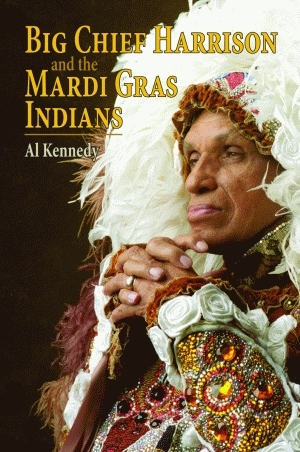 This revealing biography presents a peek into the life of a remarkable man and chronicles his journey to become the Big Chief of an internationally recognized Mardi Gras Indian tribe and a staunch supporter of education. Based on more than seventy interviews with friends, family, and such notable musicians as Clyde Kerr, Jr., this biography exposes the man and complex mind beneath the colorful plumes. 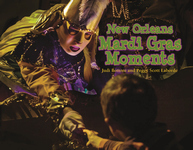 This illuminating book, which also provides insight into the secretive world of the Mardi Gras Indians, will captivate jazz aficionados, New Orleanians, and those who simply love the city. As a teacher of American history at the University of New Orleans, award-winning author Al Kennedy frequently lectures on the city’s musical heritage. His expertise has earned him several honors, including the Jazztown Award, the New Orleans International Music Colloquium Jazz Supporter Award, and the Mardi Gras Indian Hall of Fame Blue Eagle Award. Kennedy earned his BA from Loyola University, a master’s degree in public administration, and a PhD in urban studies/urban history from the University of New Orleans. He resides in Metairie, Louisiana, with his wife.